Our church's food thrifts store that sells food to raise money for our food distribution center had boxes of peaches for $8. I bought one box yesterday, and was delighted to find that they were freestones and sweet and juicy. This afternoon, after processing one box, I went back and bought four more so I think this will be the week of peaches in our home! I must share that this was such a blessing as I was unable this year to pick all the strawberries I usually pick every June (big belly and all) and it was sort of a sad realization that we'd be wintering without jars of strawberry jam put up. So what to do with ninety or so pounds of peaches? 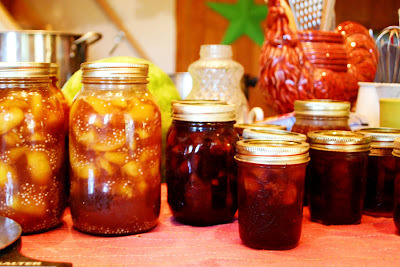 The first batch of jam I made was Peach Wine Jam. It is oh-so-good. 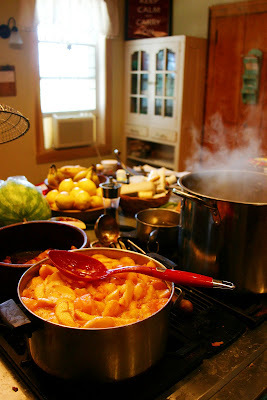 Bring chopped peaches, wine, lemon juice and pectin to a boil in a very large pot, stirring constantly. Add sugar, return to a full boil and boil hard for one minute. Remove from heat and stir in spices. Ladle into sterilized pint jars and process in a hot water bath for ten minutes. Pears can also be substituted in this recipe (yum) and I'm sure you could also halve the peaches, leave out the pectin, lessen the sugar a bit and have a delicious wine/simple syrup to can peaches in. Next I canned quarts of peach pie filling and made another batch of jam, this time Lemon Peach Jam, basically made as regular peach jam with the zest of a whole lemon added in. And that took care of one box of peaches. :) The oldest two helped me peel, pit and halve a few pot fulls of peaches which are drying in the convection oven overnight. 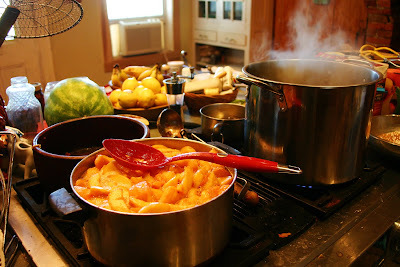 I'd like to put a few pans of peach cobbler in the freezer, make lots more jam and dry a lot more of the peaches. Any other great peachy recipes to share with me? Peach pies freeze well and what do you think about pickled peaches. My mom used to make a few batches and they were good - especially in the winter. 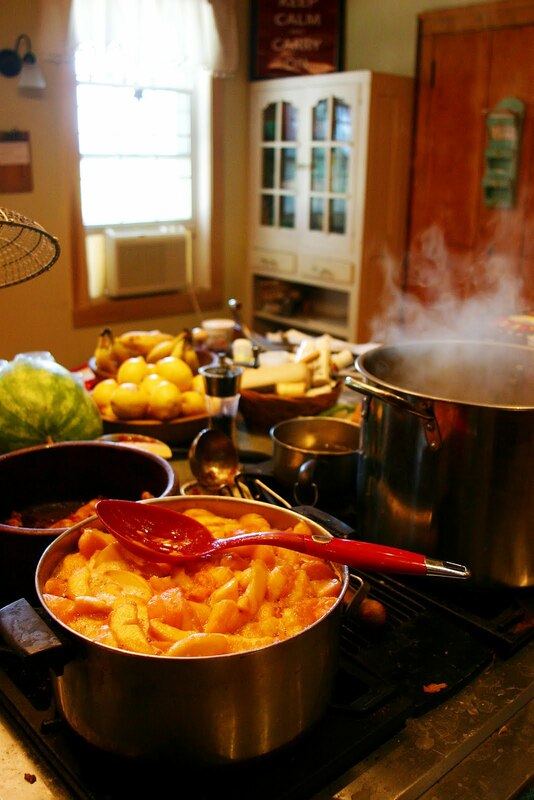 Allrecipes.com has several recipes for them and others with peaches in them as well. Ever try peach kugen? Yummo!!!! thankyou, I neede a recipe for some of my fav. fruit! What can i substitute instead of the wine? What a blessing! I just saw a recipe for pickled peaches, Karen. I made somethign similar with pears a few winters ago, called spiced pears, which were everyone's favorites over the plain canned pears. Kim, thanks for the idea! Christina, if you don't have wine handy (all the alcohol cooks out) you can substitute grape juice or water. I sure am ready for some peaches now! I've never preserved them and I think I just might give that a try! My family did our peach picking this past Friday. 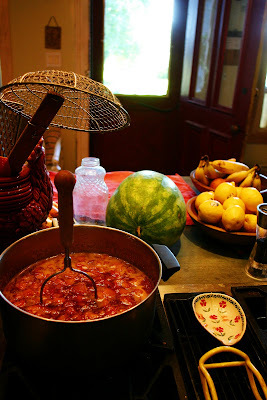 I made some jam and then decided on a peach chutney. It came out so good. I couldn't find a recipe i liked, so i took liberties with one i found. So good with chicken, pork, ham, etc. Here's the recipes in case you want to try it. Saute shallots in oil until golden. Add pepper flakes, cook for one minute. Stir in vinegar, sugar and raisins. Season with salt and pepper. Simmer until syrupy. Add peaches. Simmer hard until it looks like chutney. I'm a bit paranoid. So i processed my jars in a water bath for 15 minutes. I got 5 8oz. jars with this recipe. You may get more or less depending on the amount of onions and raisins you add. Enjoy! And I love your blog. Been reading it since winter 2008. I'm blog shy. This is my first comment on here. Good luck on the new little one. Have a wonderful summer! Hannah - I made your recipe this last weekend, thank you so much for sharing it! My kiddos can't get enough of it! So yummy! I love peaches - they scream summer time to me. We went to a local farm recently and came home with a bunch of fuzzy juicy goodness. Here is a recipe we used for a cool treat. It was easy and YUMMY.